Mahatma Gandhi was born on the crossroads of our history and gave the country a purposeful direction. He made his mark as a reformer, as a thinker, and as a liberator. He was a practical idealist. His sense of observation, analysis, and experimentation even at a comparatively younger age gave him a distinctive mental quality and approach to the matters that he confronted. He was, as Romain Rolland remarks, "familiar with the best that Europe and America have produced." He was as familiar with the Bible as the Quran believer. Bhagavad Gita and Upanishads had a new meaning for him. He drew the best out of these. In his constructive programme, he gave the first place to communal harmony among the people of different faiths. The result was the famous book, The Way To Communal Harmony, written by Gandhi himself. In this collection of his writings and speeches, one is struck again and again by the passion and sincerity with which he pleaded for the cause of better understanding among individuals and communities. The books is a compilation of Gandhi's reflections on certain problems that divide mankind. Everywhere in the world, individuals and groups are divided because of fear, suspicion, and hatred towards each other, which further depends on whether the division expressed itself along religious, economic, political, caste, or colour lines. Whatever is the form, insecurity is perhaps the major cause of individual or social dissensions. A person, who is integrated and sure of himself, fears none and consequently provokes no fear. We have examples of such heroic individuals. But we do not have till now instances of societies or communities that are fully integrated and therefore fearless. "I am striving to become the best cement between the two communities. My longing is to be able to cement the two with my blood, if necessary. There is nothing in either religion to keep the two communities apart. In nature there is a fundamental unity running through all the diversity. Religions are no exception to the natural law. They are given to mankind so as to accelerate the process of realization of fundamental unity. The need of the moment is not an establishment of a Universal religion but there is a greater need to develop mutual respect towards the different religions." The basic principle, Truth, inspired all his thought and action. It was the realization that an inviolable harmony exists in all creation and any violation of that harmony would create disaster. He saw this principle enshrined in all religions, which led him to accord equal respect to all faiths. Vasudhaiva Kutumbakam of the Vedic tradition to him was no different from the Quranic belief that Allah the Beneficent and Merciful was the creator of all that we see and hear about and that He would dispense justice on the basis of deeds and not the professed faith of each person. Nor was it different from the Christian faith that God's love and benediction was for all without any distinction and so on. All religions insist on equality of human race and on developing a harmonious relationship with the entirety of creation. Any violation of the principle of equality gives way to conflict and violation. 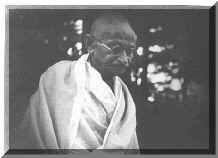 Gandhi regards Islam as a religion of peace in the same sense as Christianity, Buddhism, and Hinduism. No doubt, there are differences in degree. He says in this regard that he knew the passages that can be quoted form the Holy book Quran to the contrary. But it is possible to quote from the Vedas to the contrary. "My reading of the Quran has convinced me that the basis of Islam is not violence but is unadulterated Peace. It regards forbearance as superior to vengeance. The very word "Islam" means peace, which is nonviolence. My experience of India tells me that the Hindus and the Muslims know how to live at peace among themselves. I decline to believe that the people have said good-bye to their senses, so as to make it impossible to live at peace with each other, as they have done for generations. The enmity cannot last forever." Gandhi had never accepted in principle the theory of the Hindus and the Muslims being two distinct nations and he tried to convince both of them of the pernicious character of this principle. He continued to the last day of his life to instill the lesson of unity among the communities of India. It is remarkable that how by his honest and fearless advocacy of communal unity he had enraged many of the Muslims and a negligible few among the Hindus. The Muslims looked upon him as an enemy, while some Hindus felt that by showing humility, respect, regard and partiality for the Muslims, he was jeopardizing the cause of the Hindus. Those Hindus, who did not like his efforts, conceived the idea of getting rid of him. So he was shot to death on the prayer ground. It was a tragic end. The great leader, however, clearly saw the time coming when people belonging to different faiths will have the same regard for the other faiths that they have for their own. Just as in nature a fundamental unity runs through all the existing diversity, so also in religions there is a fundamental unity, which one has to recognize and realize. In order to discover this underlying unity among all religions, Gandhi had with him a master key of Truth and nonviolence. He stressed upon universal peace, brotherhood, and reverence for all life. He emphatically stressed upon ethical teachings in school curriculum, as he believed that the fundamentals of ethics are common to all religions. The conflict of the creeds and religious recrimination, he detested most. He preached that we must eradicate from our midst the secret pride that our religion is truer than the other religions. Our attitude towards all other religions must be absolutely clear and sincere. He wanted unity of heart and mind among Hindus and Muslims. Communal harmony always received priority over other programmes. All religions teach men to be good and peaceful. Intolerance is the religion of the negative. The Gita, the Quran, the Bible, the Granth Sahib, the Zend Avesta contain gems of wisdom, although the followers might belie their teachings. "The essence of true religious teaching is that one should serve and befriend all. I learnt this in my mother's lap.